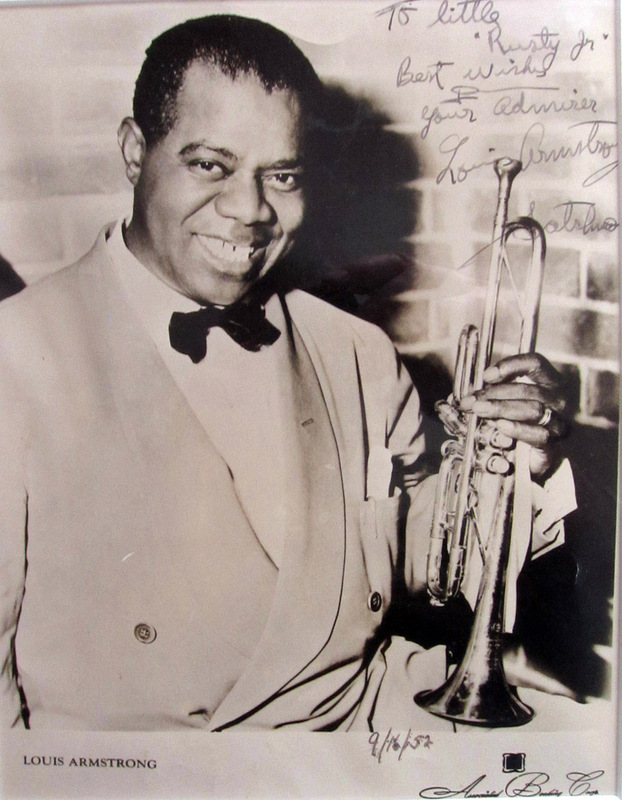 In reviewing the materials that were saved by my Father and Mother over the years since his roughly 1-1/2 years with Louis Armstrong’s All-Stars, I’ve chosen these items to post as the first of several blogs that I’ll be generating about my Dad’s career with Louis and others. I hope Armstrong fans and jazz history buffs will find them as interesting as I do. 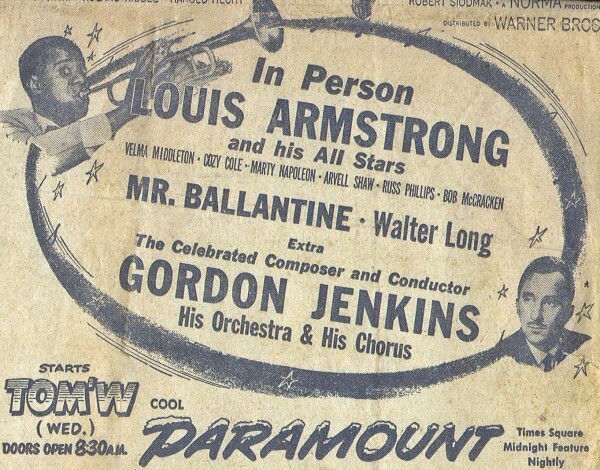 Here’s an ad from the Tuesday August 23, 1952 New York World Telegram and Sun that promotes the All-Stars Paramount Theater engagement beginning on the following day, Wednesday. Everyone on the band and on the show’s bill is listed. The top half of this ad featured a promo for “The Crimson Pirate” starring Burt Lancaster. The Paramount engagement was important enough for my Dad to save a lot of materials relating to that time. Here are photos of everyone on the bill and more. Sorry, nothing from Burt Lancaster. This shot shows the entire band. 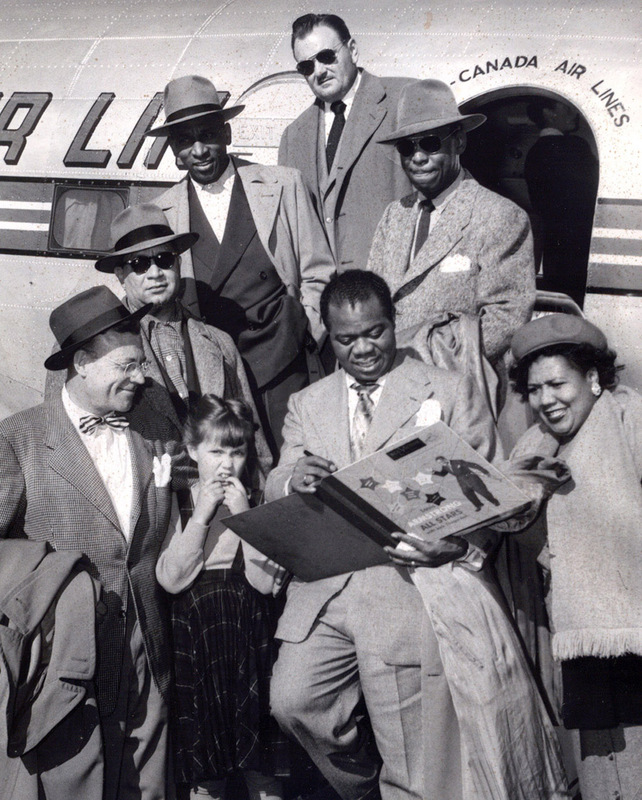 Left to right – My Father, Russ Phillips, Marty Napoleon, piano, Louis Armstrong, Cozy Cole, drums, Bob McCracken, filling in for Barney Bigard on clarinet and Arvell Shaw, bass. 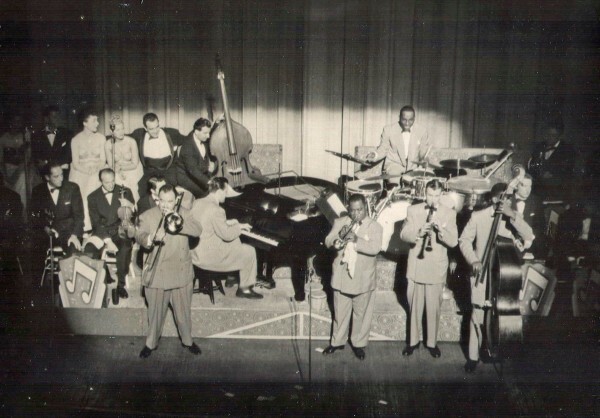 I can only guess that the other musicians and performers on stage with the All-Stars were members of Gordon Jenkins’ Orchestra. 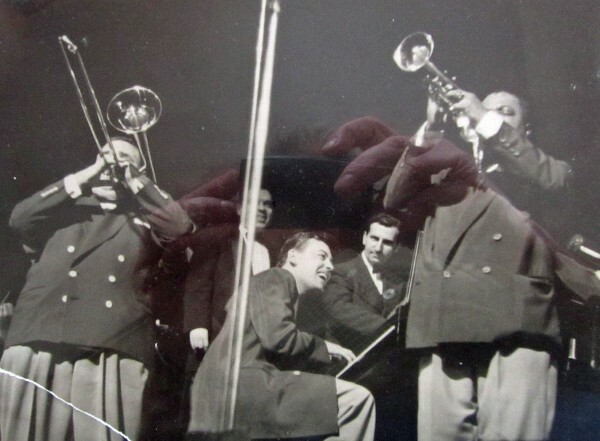 A closer view of my Dad and Louis with Marty Napoleon obviously having a good time! Please excuse the reflections as this is one of several photos in archival frames on our walls. Velma with Pop and Pops! 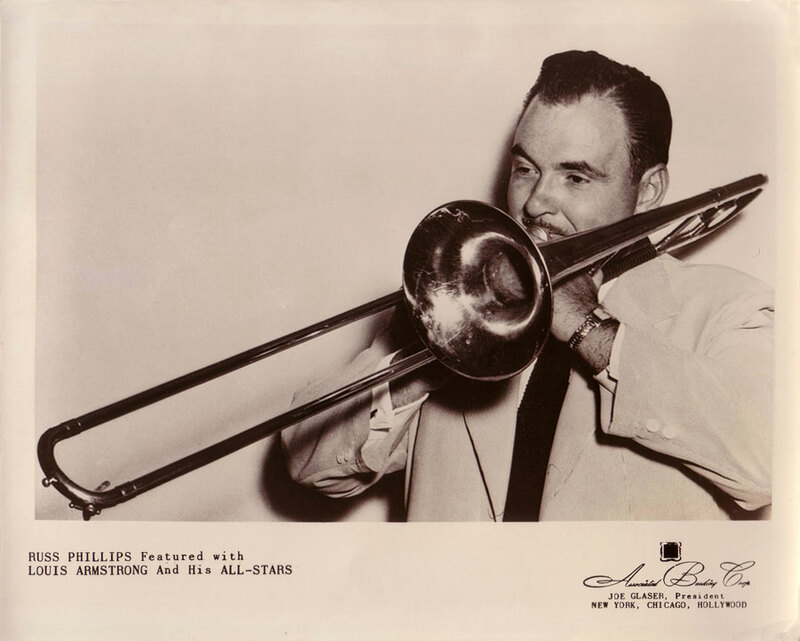 Dad loved his time with the All-Stars and always spoke highly of everyone, but he was especially fond of Velma. 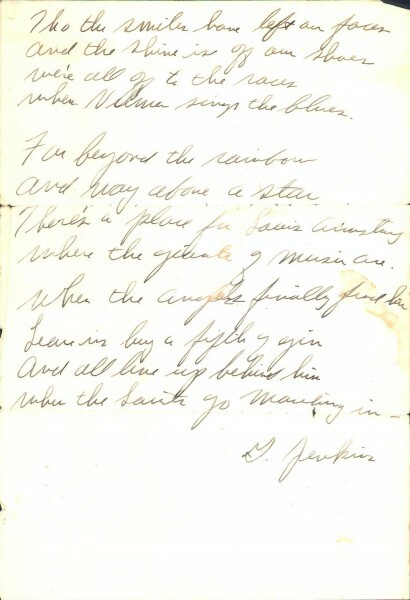 I should add here, that while my Dad was a member of the band, my Mother and I almost always accompanied him. No doubt I was backstage during these performances at the Paramount. All the band members, Louis included, couldn’t have been nicer. Carl Balentine or Mr. Balentine had a very funny magic act. I ended up playing his act in an industrial show here in Chicago about 35 years later! 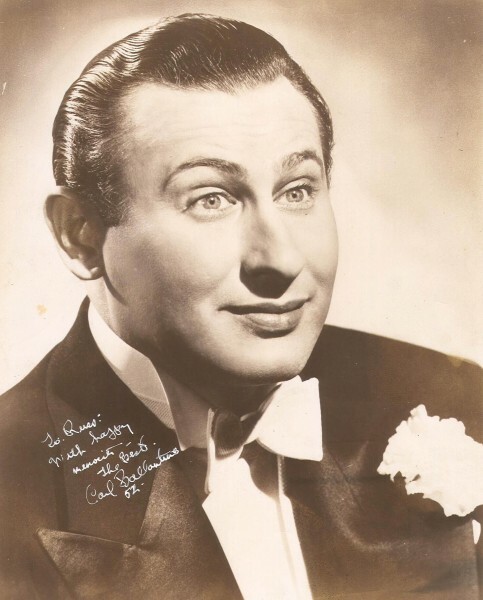 Walter Long was a dancer. 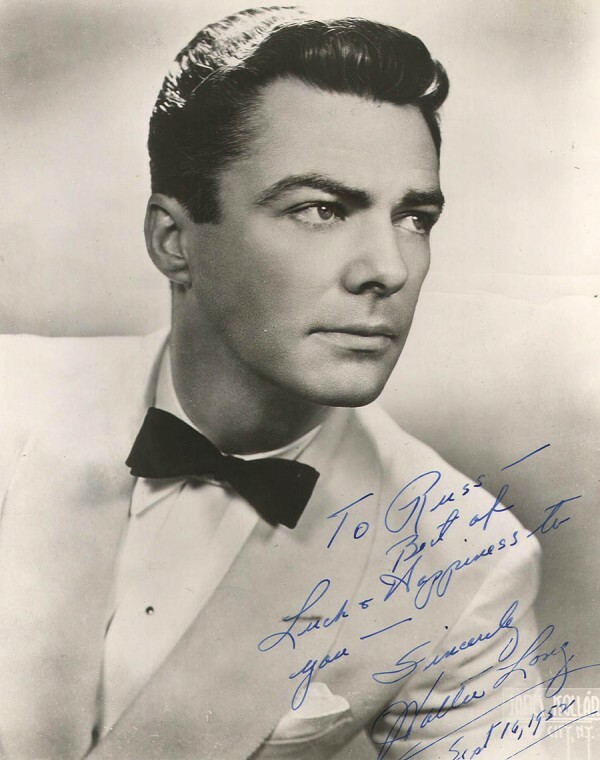 I’ve found him listed in the casts of several movies of the period, notably from this Chicagoan’s point of view, “Wabash Avenue” which featured Betty Grable, Victor Mature and Phil Harris. My Father often spoke of spending a great deal of time with Gordon Jenkins, the great arranger and composer during this engagement. 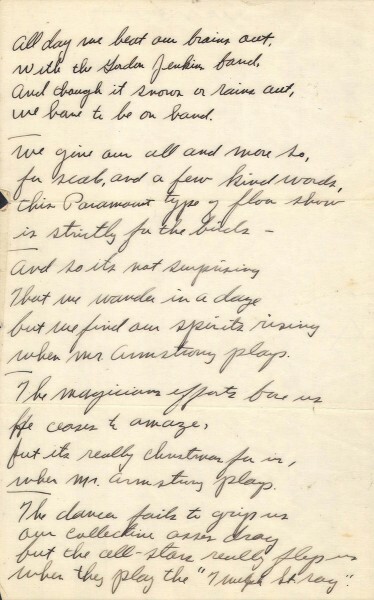 So much so, Jenkins gave him a poem he wrote about the time spent at the Paramount and with the All-Stars. 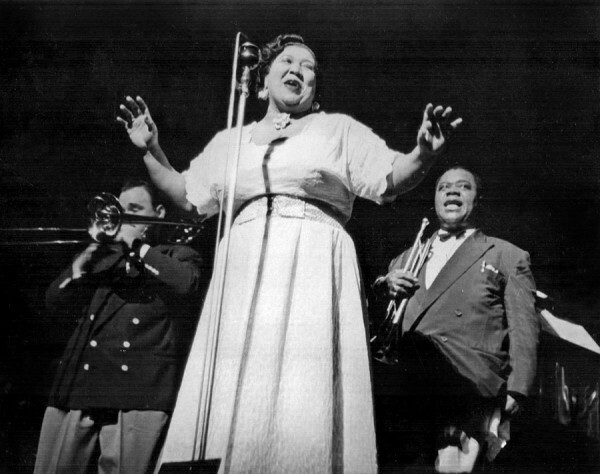 with the Gordon Jenkins band. we have to be on hand. when they play the “Twelfth St. Rag”. where the giants of music are. This entry was posted in Louis Armstrong's All-Stars on March 5, 2013 by admin. 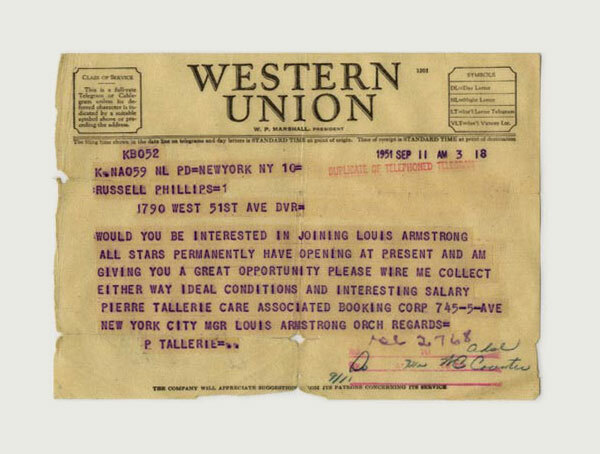 Telegram from Associated Booking in New York to my Father, Russ Phillips, Sr. offering him the job with the All Stars. 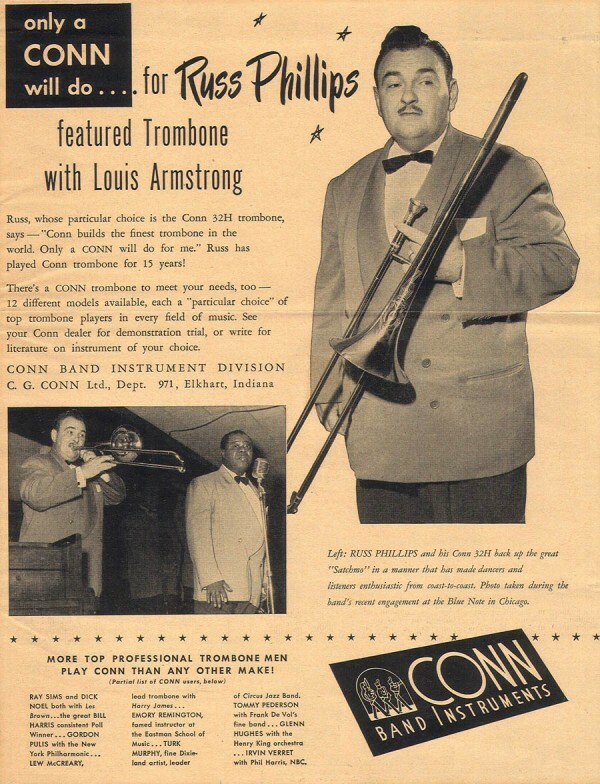 This was the “blurb” in the October 1951 Downbeat Magazine reporting that my Dad had joined the “Louis Armstrong Combo”. One of my favorite pictures. I don’t know where the band was coming from or going, but it must have been taken late in 1951 as Earl Hines was still with the band. 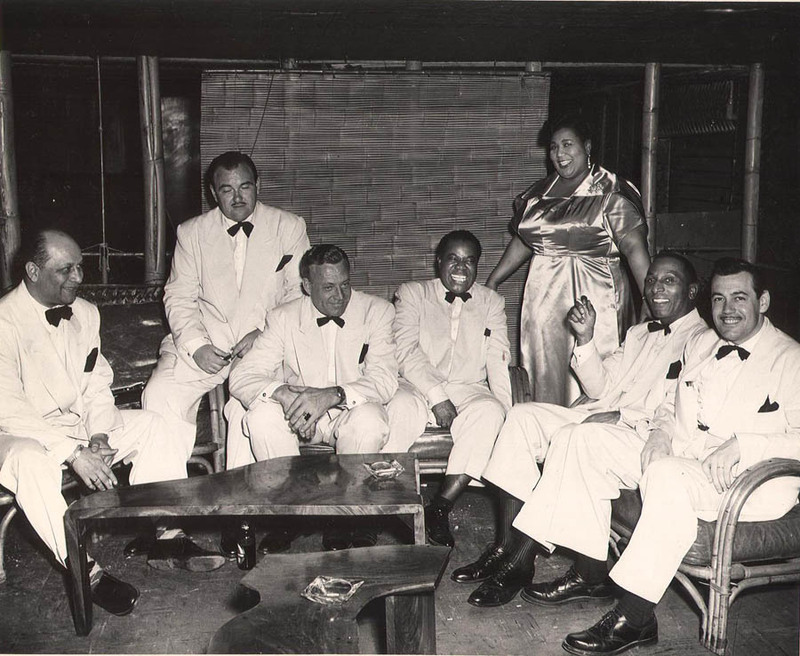 Shown are my Father top, Cozy Cole and Earl Hines below him left and right. Barney Bigard, Dale Jones below Barney on the left, unknown little girl for whom Louis appears to be signing a record album. 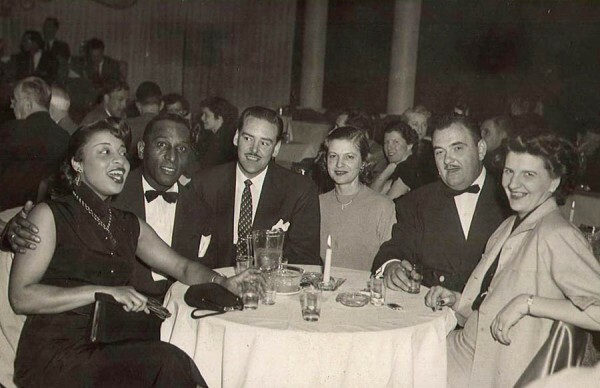 Velma Middleton is at the bottom right of the picture. Here’s a picture of the band in Hawaii. The only trip the band took that my Mom and I didn’t go along. Pictured left to right are Barney Bigard, my Dad, Dale Jones, Louis (very tickled about something), Velma, Cozy and Marty Napoleon who joined the band on piano after Earl Hines left to form his own band as mentioned in the Downbeat piece above. Speaking of Downbeat, this ad appeared in the September 24, 1952 Downbeat. 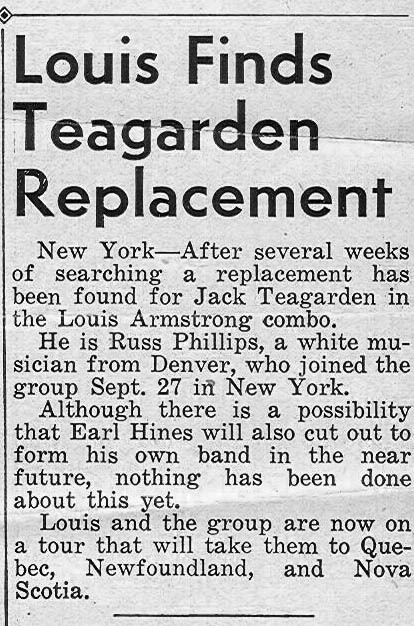 Interestingly, I believe my Dad had either just left or was about to leave the band when this appeared. My good friend and great trombonist Dan Barrett gave me this copy of Downbeat from his collection. Thanks Dan! Here is Lee Cole (Cozy’s wife) and Cozy with my Dad and Mother with an unknown couple. I can only guess the All-Stars were playing at this club or had just finished playing. Note the matching double-breasted jackets and bow ties on Cozy and my Father. 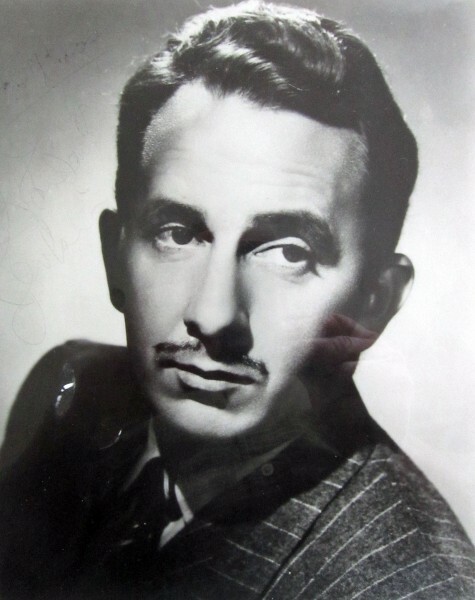 One of my Dad’s publicity shots. 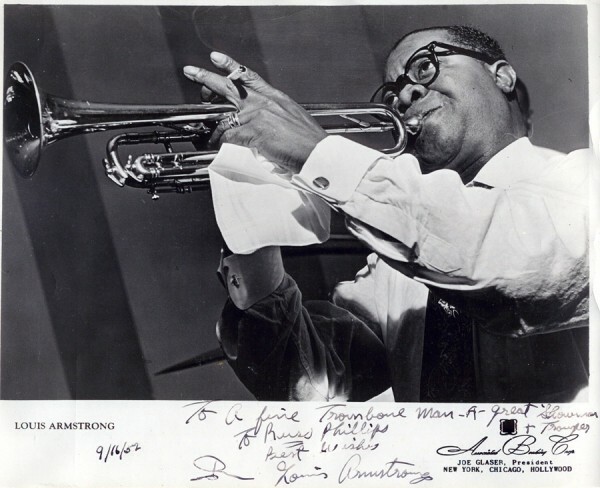 This entry was posted in Louis Armstrong's All-Stars on February 5, 2013 by admin.